This book is meant to help twentysomethings as they figure out life and all that lies ahead of them. Had I read this book in my 20s, I’m sure my life would be completely different from what it is today. However, I’m equally sure that my know-it-all younger self would have scoffed at the suggestion of reading a book to help me figure out life. (I’m grateful my God redeems and blesses even when I choose the less-than-ideal path). So, as wonderful as this book is, I wonder how many twentysomethings who need the help and encouragement will be open to reading this book, much less using it. In nine chapters, the authors treat relevant topics from a practical point of view, using anecdotes, quotes, and research. At the end of every chapter are exercises, discussion questions, and suggestions on how to apply principles learned in everyday life. The chapter titles are: Vocation, God and Us, Past and Present, Dimensions and Rhythms, Spirituality, Work, Family, Church, and Community. In these chapters a lot is covered—from how to deal with the boring and mundane to what to do when your church doesn’t meet your spiritual needs. The more of the book I read, I more realized that it would fit into the curriculum of a Life Skills course or a small group study. Perhaps this type of setting would be a gentle way to force-feed the twentysomethings who desperately need to hear what this book says but who are resistant to anything that even subtly smacks of advice or self-help. I also think this book is a great resource for older adults—parents, uncles, aunts, grandparents, mentors—with a twentysomething in their lives. It has certainly helped me reframe my conversations with young adults. FOR THE RECORD, IN EXCHANGE FOR THIS REVIEW I RECEIVED THIS BOOK FROM NAVPRESS. 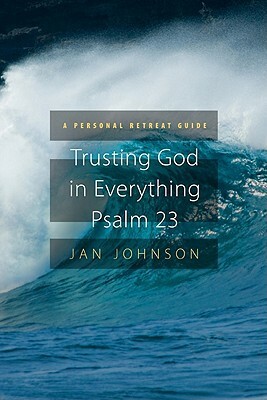 In the early pages of this book, Johnson differentiates the 23rd Psalm from the other psalms by calling it a “confidence” psalm—-While most psalms are prayers born out of despair or praise, this psalm looks at life from an objective distance. From this vantage point, the psalmist verbalizes the how and why behind the success of his life. The psalm is an acknowledgement of the psalmist’s confidence in the Power that fuels his life. Based on this foundation of helpless man’s confidence in All Powerful God, the book is divided into seven sections called meditations rather than chapters. The meditation encourage the reader take some deliberate time out to plant oneself firmly in the protective, loving presence of God—-a presence that has all things in control, a presence that brings the reader confidence to face life and all its challenges. What I especially liked about the book is Johnson’s use of various Bible versions to emphasize elements and subtle meanings evident in the psalm. For every woman out there who has missed out on experiencing the wondrous bond that exists only between a father and a daughter, this book is especially for you. For those out there who have been disappointed in relationships, be it with spouse, sibling, parent, child or friend, this book is for you too. A day-by-day study over a period of 8 weeks, this book encourages the reader to get real–to face fear, anger, pain and disappointment and reach out to our Father God who can fill the emptiness of life on earth. This is a study of the character of God from the perspective of his created being. It is an exposition of the original plan of Eden for a perfect relationship between God and man. It is also the story of Platt’s personal journey of letting go of emotional baggage and leaning on trust in God. Through her story and that of others, Platt draws the reader to reflect of God’s Word and promises as solutions to the brokenness of life. Definitely a good study guide. The book is for those of us struggling to be ourselves and see ourselves in God’s plans. 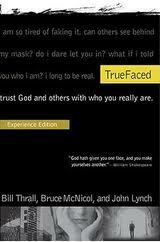 The Shakespearean quote on the cover sums it up well: God hath given you one face, and you make yourselves another. Using the metaphor of a mask, the book deals with the dangers of being untrue to ourselves and to those around us. The authors do not suggest, in any way, that people are inherently duplicitous; On the contrary, they suggest that we inherently want to do good and please others and God. It’s how we go about it that often results in mask-wearing and masquerading as someone else. The book states that our goal to do good and please is often our downfall, and suggests that we try a different approach—-Rather than trying to please God, let’s trust God. In other words, instead of letting good intentions and human effort guide our lives, let’s live in complete trust and accepting of grace. And from that trust approach will also come pleasure, both for ourselves and others. Also from that trustful living, will come fulfillment of dreams and plans that God has designed especially for us. Great book. Easy read. Lots to think about. The sooner you read it, the more time you will have to experience a more rewarding life. 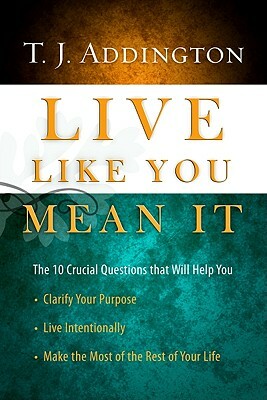 The cover very clearly tells you the book contains “the 10 crucial questions that will help you clarify your purpose, live intentionally and make the most of the rest of your life.” The foreword also underscores the merits of learning and understanding through questions–“It is in wrestling with questions, and not giving the answers, that we grow and change.” And with these expectations from the book, I set out on a Socratic journey of self discovery with the aid of Addington. I would have liked Addington to take the questioning approach farther and use a more purer form of Socratic strategy. Questions are not as effective when they are followed by the answer and illustrative examples. Lessons are better understood and remembered when the questions arouse interest and curiosity while leading the learner to discover the answer and relish the gain of new, fresh insights. I felt the book did not meet the expectation set forth in the foreword. Yet, despise that one small prejudice I have about the book’s teaching strategy, I feel the substance of the book and the logic of Addington’s treatment of the topic are worth the attention of any Christian committed to a lifestyle focused on God’s calling. Click here for details about Live Like You Mean It. It took me a very long time to get through this book. Not because of any complexity in language or subject, but because some portions of it made me uncomfortable. And that’s a compliment to the book. I felt like I was back in Situational Ethics, my freshman year in college. I was forced to confront my reasons for the choices and decisions I make as a Christian. I found myself questioning the boundaries of my Christian lifestyle that have been erected by my church, my community, my family and myself. A conservative, third-generation Seventh-day Adventist, I have a lot of these boundaries–restrictions on lifestyle, diet, entertainment. I even have some that are self-inflicted. So when Crowe compared boundaries in the Christian life with the plastic covers on electrical outlets, I squirmed a little, and began to question my Christian lifestyle. Do the restrictions of my conservative Adventist culture define who I am as Christian? Or are these boundaries merely curbs that enclose me in a community of faith, of like-minded people who support me in my spiritual growth? Do I live the Adventist lifestyle because my church expects me to or because it is my personal decision made with the freedom I have to choose? And if boundaries are indeed comparable to the plastic protectors on electrical outlets, are they not as pertinent after a certain point in my spiritual growth? So, yes, the book was a difficult read for someone like me who has lived by the book and its rules. To question the why behind the things I do, to dilly dally in the greys of Christian lifestyle is not my favorite pastime. Yet, the book was good for me. After all the probing and questioning, I was glad that it solidified my belief system. While Crowe’s thoughts about and interpretation of some biblical passages differ from mine, I appreciate the basic principles he lays out that help the reader choose for himself a biblical approach to sticky situations and grey areas. Without forcing his theology on you, he helps you find the solution. Did the book make a difference in my life? No, it didn’t. It was more like a visit to the doctor’s office for an annual exam–you think you’re doing okay, but you’re not sure until the results are in. Reading the book was an exercise in re-examining who I am, and I was satisfied with the result. That however would not have been the case had I read this book 20 years ago. 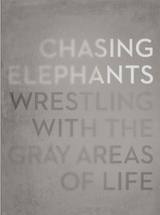 Where were you, Brent Crowe, when I was younger chasing elephants by the herds?